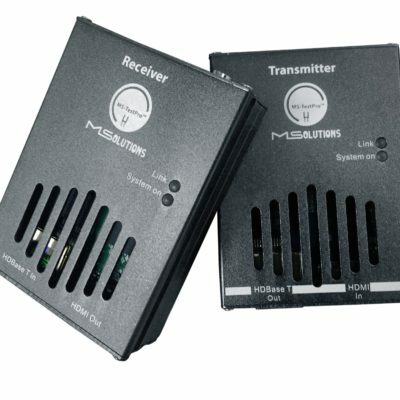 MSolutions HDBaseT Audio & Video solutions offers a specialty of products for a vast range of markets and applications. Our products and services enable system designers, integrators, consultants and installers worldwide to simplify installation and minimize maintenance. 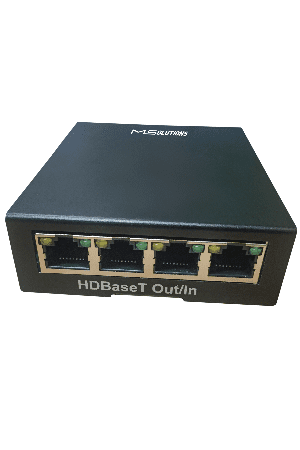 The Media Solutions HDBaseT Switch with 5 HDBaseT ports, offering a complete HDBaseT switching implementation. The HDBaseT switch, is designed to reduce the cost and effort of bringing HDBaseT switching applications to the marketplace. for extending HDR transmission distances while sustaining the highest signal quality. 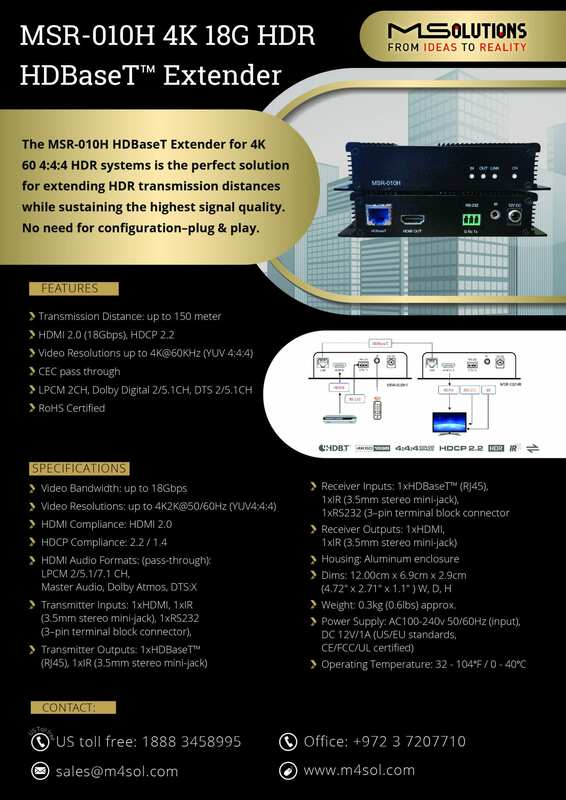 The MS-70 are high−performance, HDBaseT extenders for up to 4K60Hz (4:2:0) HDMI and IR signals over twisted pair. It extends video signals to up to 40m (130ft) over CAT copper cables at up to 4K@60Hz (4:2:0) 24bpp video resolution and provides 70m (230ft) for 1080P video resolutions. 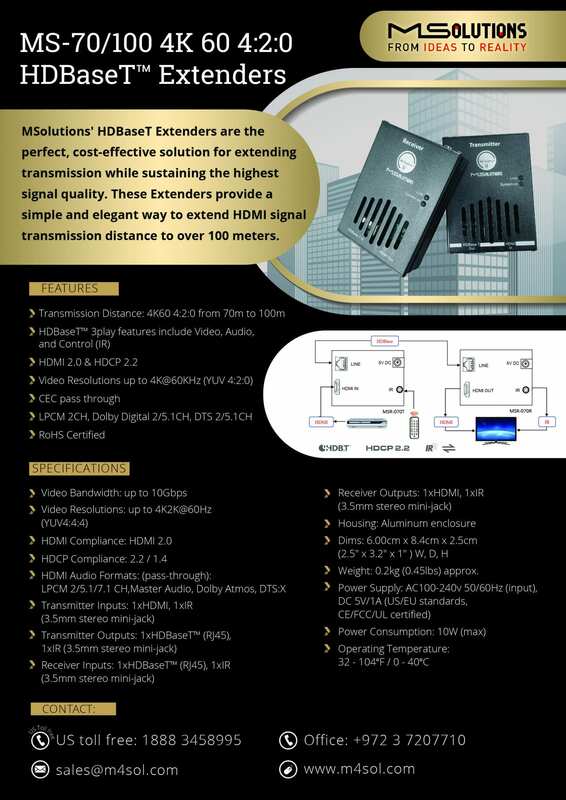 The HDBaseT Certified extenders provides a simple one-box interface solution for a single display device. 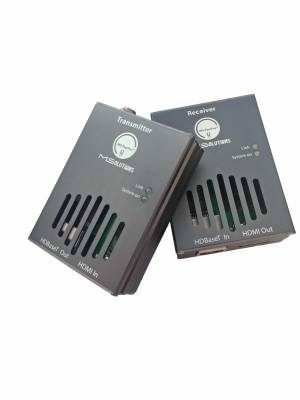 Its unique and very compact design allows it to be installed behind a display or above a mounted projector. 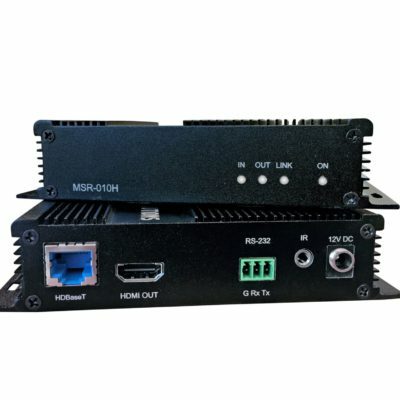 The MS-100 is a high−performance, HDBaseT extenders for up to 4K60Hz (4:2:0) HDMI and IR signals over twisted pair. It extends video signals to up to 70m (230ft) over CAT copper cables at up to 4K@60Hz (4:2:0) 24bpp video resolution and provides 100m (330ft) for 1080P video resolutions. The MS-84 is a certified HDBaseT based Switch Matrix. 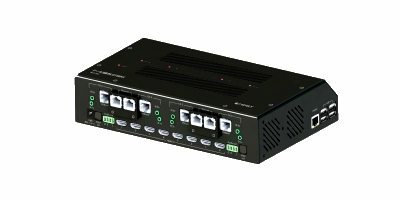 It integrates 8 HDMI inputs with4 HDBaseT outputs up to 100m over CAT5e/6/7 cable. The MS-84 features the latest HDMI 2.0 standard, providing support for 4KUltra HD video signals. MSolutions technology is designed using HDBaseT Alliance specifications, ensuring interoperability with other HDBaseT certified products.